Note: Members of the Coastal Carolina Camera Club graciously have agreed to photograph bridge construction while I am homebound with medical problems. See http://www.coastalcarolinacameraclub.org/ for information about the Club. Page 7 -- There is overlap of dates on Pages 6 and 7. 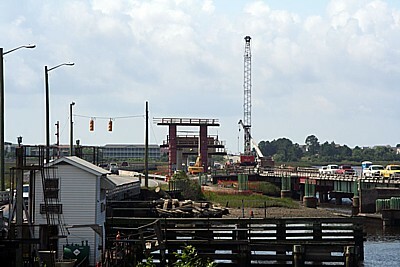 This photo shows the work bridge from which construction workers are building half of the new bridge. 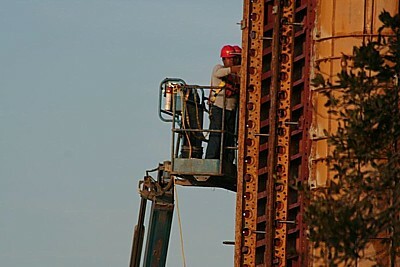 Green rebars for a column are on the left. 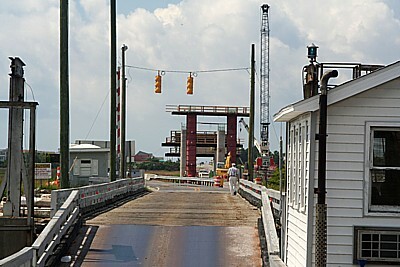 The is a excellent shot looking at the bridge from the Intracoast Waterway back towards the mainland. The column closest to the photographer is the column for Bent # 14. It still has the forms on it. 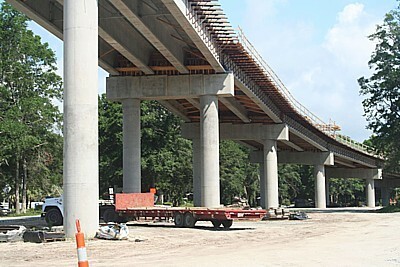 This photo captures the underside of part of the mainland portion of the new Sunset Beach Bridge. It will end near the fire station on an "end bent" over which vehicles will enter and exit the bridge. 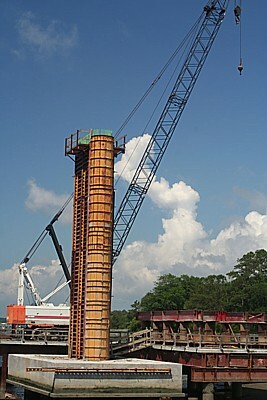 The various wood forms and braces underneath and to the side of the bridge allow for the construction of the bridge deck. 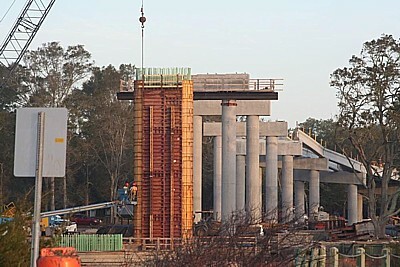 Five things are shown in this photo: the old bridge house, a small section of the causeway detour, columns for the new bridge, steel rebars on which columns will be built, and the work bridge from which construction workers can reach nearby portions of the new bridge on which to work, such as those rebars. Workers vehicles are parked on the work bridge. These two photos show the most important reason a new Sunset Beach Bridge is needed. The photo on the left shows the old bridge angled downward at low tide. According to documents filed during debate over construction of the new bridge, during low and high tides, emergency vehicles have to go very slowly across the floating part of the bridge which, due to the rising and falling tides is at a different elevation than the fixed roadway. Some emergency apparatus, such as ladder trucks and tanker trucks are unable to cross the bridge due to the angle of the floating part of the bridge. In addition, if a ladder truck or tanker truck crosses the bridge at normal tide, that vehicle may get trapped on the island when the tide rises and falls, thus preventing firefighters from responding to another call off the island. There have been occasions when emergency vehicles have been delayed getting off the island enroute to the hospital due to delays associated with the bridge." Bookout Affidavit, P. 6, 7. 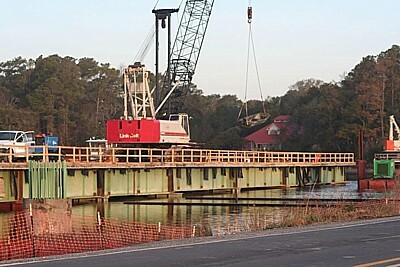 Additional problems result from weight restrictions of the old bridge that prevent large fire trucks from both Sunset Beach and Calabash from crossing the bridge. 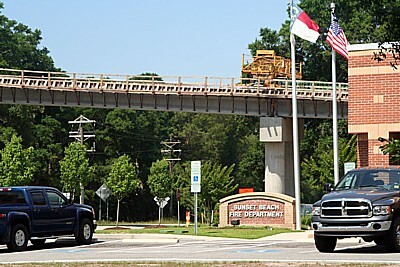 The new Sunset Beach Bridge ends beside the fire department. Nothing will prevent firefighters from rapidly crossing the new bridge. Breakdowns, backed up traffic, and a single-land pontoon bridge will be history. Presently, if the old bridge prevented firefighters from hurriedly reaching a house fire, half of the houses on the island could be burned down.